Brad Inman's goal with 10 minutes remaining earned Crewe a point in a six-goal thriller against Bury. Winless Crewe went ahead when on-loan midfielder Adam King clipped the ball into the top corner before Danny Mayor made it 1-1 after Chris Hussey's pass. Ryan Colclough scored from Billy Bingham's free-kick to restore the hosts' lead before Tom Soares levelled. Danny Rose put Bury in front from Hussey's cutback but Inman ran clear and shot into the corner to equalise. 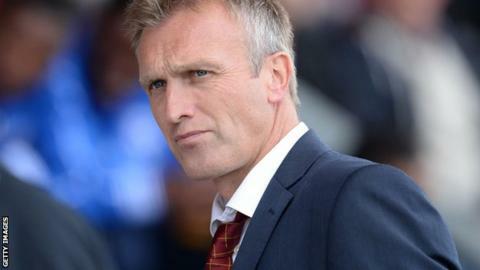 "I never felt threatened totally by Crewe. We dominated large spells, the players felt that we dominated the ball and that we were really threatening. "All season we've looked really threatening and really powerful. You do worry as a coach when you're not creating chances, but we've created a hatful against every team we've played. "But now it's my job, as a manager, to make sure that we try and close the door at the back and make sure we lock it down because we've conceded too many this season." Match ends, Crewe Alexandra 3, Bury 3. Second Half ends, Crewe Alexandra 3, Bury 3. Attempt missed. Nathan Cameron (Bury) header from the centre of the box is just a bit too high. Corner, Bury. Conceded by Jon Guthrie. Substitution, Bury. Jacob Mellis replaces Tom Soares. Attempt saved. David Fox (Crewe Alexandra) right footed shot from outside the box is saved in the top right corner. Corner, Crewe Alexandra. Conceded by Chris Hussey. Jon Guthrie (Crewe Alexandra) wins a free kick in the attacking half. Substitution, Bury. Hallam Hope replaces Danny Pugh. Goal! Crewe Alexandra 3, Bury 3. Bradden Inman (Crewe Alexandra) right footed shot from the centre of the box to the bottom left corner. Corner, Crewe Alexandra. Conceded by Joe Riley. Attempt missed. Tom Soares (Bury) header from the centre of the box is too high. Hand ball by Chris Hussey (Bury). Attempt saved. Chris Hussey (Bury) right footed shot from the centre of the box is saved in the bottom right corner. Attempt missed. Tom Soares (Bury) right footed shot from the right side of the six yard box is close, but misses to the right. Substitution, Crewe Alexandra. George Cooper replaces Adam King. Corner, Bury. Conceded by Oliver Turton. Substitution, Bury. Chris Sedgwick replaces Danny Rose. Peter Clarke (Bury) wins a free kick in the attacking half. Attempt blocked. Billy Bingham (Crewe Alexandra) left footed shot from the left side of the box is blocked. Goal! Crewe Alexandra 2, Bury 3. Danny Rose (Bury) right footed shot from the centre of the box to the high centre of the goal. Assisted by Chris Hussey with a cross. Attempt missed. Danny Mayor (Bury) right footed shot from outside the box is just a bit too high. Corner, Crewe Alexandra. Conceded by Christian Walton. Attempt saved. Ryan Colclough (Crewe Alexandra) right footed shot from the right side of the box is saved in the top right corner.